The more I learn about our nation’s military and the officers and soldiers who serve, the more I admire them. American business could improve a great deal by learning from the military’s continual and experiential approach to leadership development. The U.S. Military invests as much time in building capabilities as it does in executing them, and “training” is an all-the-time duty, even during active war times. American business takes the opposite approach – and it shows. Training is an “HR” duty resourced during good times, and reduced or eliminated when things get tough. Military-style experiential ongoing development is almost unheard of. If our military was run like the average American business, well, the United States would be out of business by now. So much corporate time and money are put into training and so much time and money are wasted. Why? And if training is so important, why is it so easily reduced and eliminated during tough times? Most people already have the basic skills and knowledge they need to succeed. Most every job requires some form of “boot camp” where the basics are learned (apprenticeships, on-the-job training, college, etc.) Skills and knowledge are the outcomes of training and education. Employees generally know What to do and What to think. They may be lax in Why to think, however; and little if any sustainable attention is given to How they think. Too few businesses have the equivalent of a “war college” where they develop their best and brightest. This is not the case, however, with the U.S. Military. Often derided in the world of corporate “leadership speak” as command-and-control leadership, the various branches of the U.S. military are actually great models for how learning and development can and should be approached by those outside the military, including corporate America and our public schools. I had the opportunity last year to facilitate strategic planning among the joint command officers of the Illinois National Guard Army and Air Force. This was by far the most impressive group of leaders and thinkers I have had the pleasure of knowing. Whether their development was culminated at the Army War College or MIT, these were humble yet brilliant, capable men who never stopped learning, who never stopped growing and developing. They know What to think, How to think, and Why good thinking was critical to their work. Executing strategy and improving the organization are not separate, cyclical functions in the U.S. Military; they are parts of an integral and continual mission-critical process. That’s what makes our military men and women great; it’s what makes our country great. This integral approach to leadership development is missing from the majority of American businesses. Too few leaders are prepared for the constant Volatility, Uncertainty, Complexity, and Ambiguity that define the context of leadership. Performance Development Network specializes in developing these creative and critical thinking abilities among people who lead in this 21st Century context. 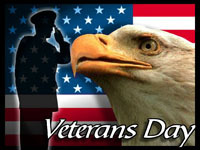 This entry was posted in development, leadership, military, training, veterans day. Bookmark the permalink.